Coconuts Beach Bar on the “Other Side” of Cozumel. Cozumel Island is like the Amsterdam of Mexico, albeit a little more aggressive. 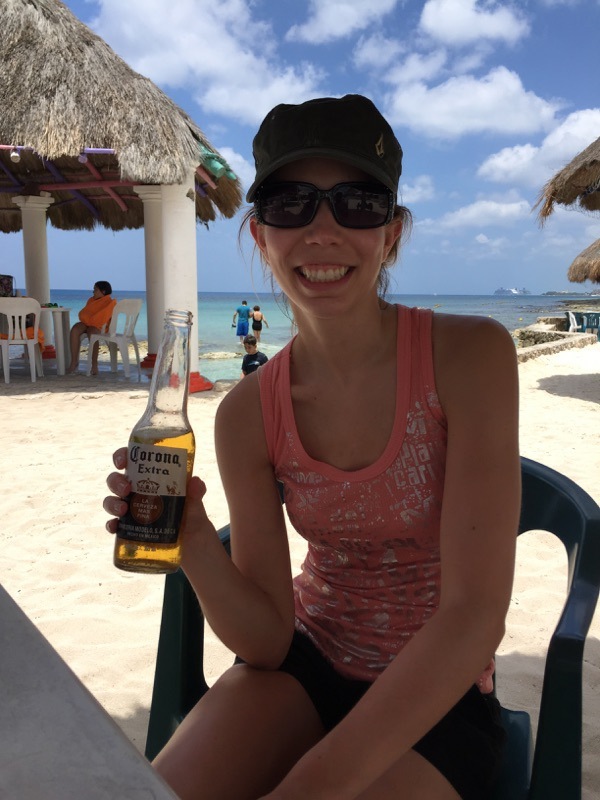 One of the few enjoyable days on our honeymoon included our day trip to Cozumel. For me, it was special because Jack has come so far from our first trip to Mexico where taking a cab into the closest town to go shopping was a complete nightmare for him. His “every day has the potential to be the zombie apocalypse” attitude (paranoia) results in massive anxiety whenever I mention leaving our cozy resort. This time he was actually pumped to take a ferry ride, rent a car, and hit the road for an ADVENTURE OF A LIFETIME! Okay so it wasn’t that much of an adventure. I almost puked on the ferry ride there. Our second turn out of the car rental place almost ended in us getting t-boned due to a dumb tourist trying to make an illegal U-turn and us (other dumb tourists) trying to turn left onto the main road behind her. Other than that, the most dangerous part of our trip was renting a vehicle from a place called Rentadora Isis. Jack felt very much in his element driving in Cozumel. In Canadian standards, he’s an effing a-hole to be reckoned with on the highways. But here, aggressive driving behaviour is the norm, and suicide passing tourists – a favorite pass-time. We drove the main boulevard south and then to the east side of the island where Jack accidentally took the beachfront bike path (in Canadian terms – “service road” or “goat trail”) in the Sentra rental. Several minutes of sheer panic and one roadside bathroom break (with a view) later, we were reunited with the real road. From there, we ate lunch on a cliff at “Coconuts” Beach Bar watching the turquoise waves crash against the rocks. For me, this was the most memorable part of our trip; and my stomach will ALWAYS remember the heat intensity of that delicious pico de gallo! Jack and I on the highest point in the world. Maybe just the highest point on Cozumel Island. Because Jack and I have short attention spans (for adults), this was the end of the road for us. We drove back the way we came (minus the goat trail) and visited Playa Corona for a quick Corona on the beach. Like true tourists, we bought our Kaluha and vanilla at the Mega mart on our way to return the car and rushed to the cigar bar by the ferry terminal for a quick goodbye drink (or 3 in Jack’s case) before setting sail to the main land. Corona at Playa Corona. We are lazy and didn’t go – but I hear there is good snorkeling at this beach. You may still be wondering how Cozumel and Amsterdam relate. I have never been to Amsterdam, but have heard that weed (marijuana) is easily obtained over there. Jack and I are not certain, but we are pretty sure we witnessed a top secret “exchange of assets” go down at the ferry pier in Cozumel. This would not be something out of the ordinary if the suspects shouldn’t be arresting themselves (if you know what I mean). And, Jack really hopes you don’t know what I mean because in his mind, it’s a conspiracy. And you can never be too careful. If you ever get the chance to go to Cozumel, GO! It is one of the most beautiful places I have visited, and the only thing cheaper than the booze (and maybe the mary-jane) is the vanilla! This Post was posted in Housewife, Humor and tagged Coconuts Beach Bar, Cozumel, culture, honeymoon, housewife, humor, Lady Leisure Laughs, Mexico, Playa Corona. Bookmark the permalink.